Corneal dystrophy is an inherited genetic disease. It is never caused by an injury or improper diet. If corneal dystrophy afflicts the cornea, the outer layer of the eye becomes cloudy and it usually strikes in both eyes. It is difficult to detect with the naked eye until it is fairly advanced. Look for a crystal-like substance in the eyes. 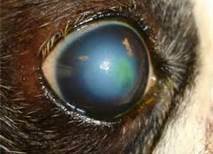 There is no treatment and no way to prevent corneal dystrophy, but in most cases the boxer will not lose all of the vision. We screen our boxers annually for inherited eye diseases. A board-certified opthalmologist examines each dog and the results are published in the dog's OFA record on line. We publish all results, no matter whether we like them or not.